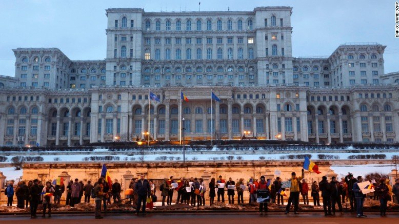 An executive order that reduces penalties for abuse of power prompted hundreds of thousands of people across Romania to come out in protest. The government has now agreed to repeal the controversial decree. However, this has not stemmed anger as the protesters want PM Sorin Grindeanu to resign so he cannot push through the same amendments in a different form. These are the largest protests since the overthrow of communism in 1989. What have the protestors achieved? 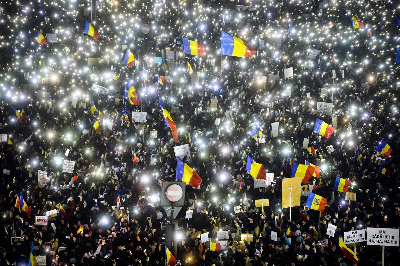 The 220,000 protesters that filled the Piata Victoriei square in central Bucharest have succeeded in pressuring the Romanian Government into withdrawing a decree that would decriminalise corruption offences. The mounting pressure has brought about an embarrassing U-turn for the country's new Prime Minister in the face of week-long demonstrations. The Government also declassified the transcript of debates during the cabinet meeting when the decree that would have shielded many politicians from prosecution was approved. A day after Prime Minister Sorin Grindeanu belonging to Social Democratic Party (SDP) said he did not want to divide Romania, his cabinet held an emergency meeting to scrap the decree as tens of thousands of demonstrators outside chanted "thieves, thieves" and "resignation, resignation". Critics saw it as an attempt by the government to let off many of its own officials caught in an anti-corruption drive. The government had argued that the changes were needed to reduce prison overcrowding and align certain laws with the constitution. The law would have exempted abuse-of-power offences involving sums below 200,000 lei ($62,000) from prosecution, potentially shielding hundreds of officials from justice. One immediate beneficiary would have been Liviu Dragnea, who leads the governing SDP, and faces charges of defrauding the state of €24,000. The ruling coalition led by Prime Minister Sorin Grindeanu originally passed the decree, with no input from the country's parliament, on Jan 31 and was due to come into effect on Feb 10.The constitutional court has still to rule, later this week, on the legality of the original decree. Note: Romanian Leu (plural lei) is the currency of Romania. Why are the people still angry? The government hoped that by scrapping the decree, calm would return to the streets of the country - but that hasn't happened yet. 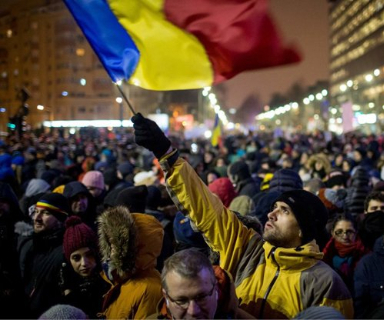 An estimated 500,000 Romanians, including more than 200,000 in the capital, Bucharest, rallied on Sunday despite their original demand being met. The protesters remain dissatisfied about a revised version of the bill which will now be put to parliament. They are also calling for the government of PM Sorin Grindeanu to resign. Nightly protests in Bucharest and other major cities have put angry citizens against a moneyed elite that stands to benefit if the law eventually passes. Many in the crowd don't trust the government to keep to its word. They are afraid that new legislation, promised by the prime minister when he abolished the decree, might contain some of the same elements in a different form. The protesters also claim that they are demonstrating against what they deem an alarming retreat in the country's fight against corruption. Huge crowds swelled in the capital's Victory Square for a sixth day in a row on Feb 6. A giant laser beamed the words "Do Not Give Up" and "Resignation" on to the government building housing the prime minister's office. "This government is organised from the high level to the low like a mafia, and we don't want something like this," one protester, Profira Popo, told the Associated Press news agency. However, Prime Minister Sorin Grindeanu said he wouldn’t resign and called for the return to calm and normality. So, there they are - thousands of people with laser lights, shining light on the Parliament of Romania as if to make the politicians understand that their ill-intentioned efforts cannot go unnoticed and unpunished. When did Romania last see a movement of his scale? This is the biggest mass protests in the country since 1989, when the Communist regime of Nicolae Ceausescu was ousted in a bloody revolution. The Romanian Revolution started in the city of Timișoara in mid-December 1989 and soon spread throughout the country, ultimately culminating in the show trial and execution of longtime Communist leader Nicolae Ceaușescu, and the end of 42 years of Communist rule in Romania. It was also the last removal of a Communist government in a Warsaw Pact country during the events of 1989, and the only one that violently overthrew a country's government and executed its leader. The country's ubiquitous secret police force, the Securitate, which was both one of the largest in the Eastern Bloc and for decades had been the main suppressor of popular dissension, frequently and violently quashing political disagreement, ultimately proved powerless in stopping the looming, and then highly fatal and successful, revolt. Social and economic malaise had been present in socialist Romania for quite some time, especially during the austerity years of the 1980s. The austerity measures were designed in part by Ceaușescu to repay foreign debts. Shortly after a botched public speech by Ceaușescu in Bucharest (Romania's capital city) that was broadcast to millions of Romanians on state television, rank-and-file members of the military switched, almost unanimously, from supporting the dictator to backing the protesting population. 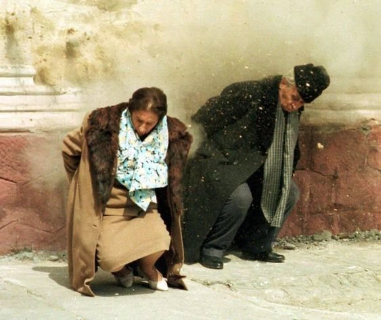 Riots, street violence and murder in several Romanian cities over the course of roughly a week led the Romanian strongman to flee the capital city on 22 December with his wife, Deputy Prime Minister Elena Ceaușescu. Evading capture by hastily departing via helicopter effectively portrayed the couple as both fugitives and also acutely guilty of accused crimes. Captured in Târgoviște, they were tried by a drumhead military tribunal on charges of genocide, damage to the national economy and abuse of power to execute military actions against the Romanian people. They were convicted on all charges, sentenced to death, and immediately executed on Christmas Day 1989, becoming the last persons condemned to death and executed in Romania. The dictator and his wife died bravely. It was as unfair a trial as any can get. On 25 December 1989, in a small room the Ceaușescus were tried for genocide and illegal wealth gathering before a kangaroo court convened on orders of the National Salvation Front, Romania's provisional government. Ceaușescu repeatedly denied the court's authority to try him, and asserted he was still legally president of Romania. He was convinced till the end that this was an American conspiracy, with support from the Russians. At the end of the one-hour show trial the Ceaușescus were found guilty and sentenced to death. A soldier standing guard in the proceedings was ordered to take the Ceaușescus out back one by one and shoot them, but the Ceaușescus demanded to die together. The soldiers agreed to this and began to tie their hands behind their back which the Ceaușescus protested against but were powerless to prevent. They were denied even the dignity of holding hands while being shot at by the soldiers. His wife, Elena, struggled and cursed at the soldiers. She shouted:"Don't tie us up!" and "Don't offend us!" She was 70 years old at the time of her execution. At the same time Nicolae Ceaușescu sang "The Internationale", a left-wing anthem that has been a standard of the socialist movement since the late 19th century. A TV crew who were to film the execution only managed to catch the end of it as the Ceaușescus lay on the ground shrouded by dust kicked up by the bullets striking the wall and ground. Executing the dictator was not the objective. The revolutionaries wanted to build a better Romania. And that, surely, has not happened. Praising the crimes of totalitarian governments and denigrating their victims is forbidden by law in Romania; this includes the Ceaușescu era. Nevertheless, according to opinion polls held in 2010, 41% of Romanians would vote for Ceaușescu and 63% think that their lives were better before 1989.In 2014, the percentage of those who would vote for Ceaușescu reached 46%. That percentage must be much higher now. Note: The Warsaw Pact, formally the Treaty of Friendship, Co-operation, and Mutual Assistance, was a collective defense treaty among the Soviet Union and seven other Soviet satellite states in Central and Eastern Europe in existence during the Cold War. 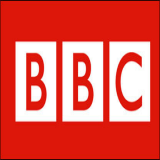 It was created in reaction to the integration of West Germany into NATO in 1955 as per the London and Paris Conferences of 1954, but it is also considered to have been motivated by Soviet desires to maintain control over military forces in Central and Eastern Europe. Where is the real issue? The situation currently in Romania is that generalised corruption and the toughest anticorruption measures of Europe have been co-existing for the past ten years.The result is not less corruption, but crowded jails. 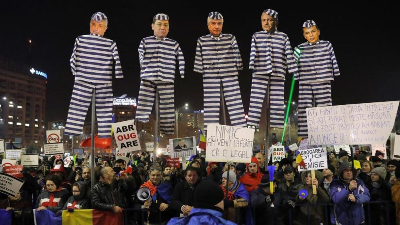 18 ministers from the governments in power since 2004 have been charged or convicted, including one prime minister, who was jailed (Adrian Năstase), and without counting another (Victor Ponta), indicted on several counts, for instance for rewarding a businessman who sponsored an event during then British Prime Minister Tony Blair’s visit to in Romania. Liviu Dragnea (the second most senior politician in the country), whose party was the big winner from December 2016 elections, could not even become prime minister due to a suspended jail sentence for having planned a lottery to encourage participation in the 2012 referendum to impeach the then President Traian Basescu. This is despite the fact that he later gave it up, realising that it was illegal. Calin Popescu Tariceanu (who ranks just behind Dragnea in his political position) is charged of not confessing a brief luncheon meeting, although there is no other crime or suspicion related to him. The charge was brought before elections, when he was still President of the Senate (and of a small, king-maker party), and after the election he was invited by the President Klaus Iohannis to switch sides. He refused publicly, and this denied Iohannis’ party the possibility of forming the government. So these are the camps. On the one hand, Iohannis, who controls secret services, and in particular the Romanian Information Service (RIS), an important source of evidence for corruption convictions until spring 2016, when the Constitutional Court asked for a better separation of roles between RIS and the National Anticorruption Directorate (DNA). His party managed just 20% of the vote, having itself being decimated by DNA investigations. And on the other, the new government coalition (250 out of 465 seats), with Dragnea unable to assume premiership due to his prior conviction, which he dismisses as ‘political’. Other than introducing legislation which kept him out of jail, Dragnea has also enacted another controversial measure:he cut the budget of the secret services by ten percent. The RIS is not an institution to trifle with.Since 2005 it has grown its network of information gathering from 6,370 wiretaps to 44,759 in 2014, double that of the FBI for a population sixteen times smaller than the US. All in the name of anticorruption. In another risky promise, Dragnea has vowed that this Parliament will try to bring secret service under proper civilian control for the first time. 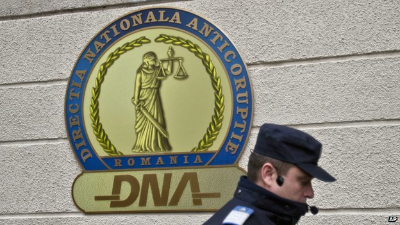 In this climate where distrust in the state is well founded, the anticorruption agency DNA has gained the trust of Romanians.However, there is a long, deep conflict between sovereignty of the Parliament over legislation and the EU-sponsored anticorruption bills that DNA uses to indict politicians. Note: Romania joined the European Union in 2007 with a promise to do everything possible to align itself with European standards in the fight against corruption, which has deprived the state of tens of billions of euros since the 1990s. The country has a state-of-the-art anti-corruption arsenal, the epicenter of which is the National Anti-Corruption Office (DNA) and its 100 independent prosecutors. The leader of Romania’s Social Democratic Party (PSD), Liviu Dragnea, probably the only man who managed to have his name booed by 600,000 people in the streets of Romania in the last 25 years, claims that the protests that have been taking place in Bucharest and all over the country in the last six days have been “professionally organized.” He also pointed the finger at multinationals for supporting the demonstrations against the Government that his party named less than a month ago. However, the protesters have so far managed to steer away from such harmful associations; they have a mixed demographic, and while some have used discriminatory language, blaming the poor for voting PSD, others reject such rhetoric. Among them are Simona, 34, and Claudiu Racovita, 33, parents of two, who have taken to the streets in protest each day since the demonstrations began. It may seem professionally organized because the country has seen several waves of mass protests since 2012, so the demonstrators are experienced and organised. Solidarity networks that provided protesters with food and services were fast to emerge, and clashes with the police have been isolated. Although Dragnea admits that some of the protesters are there out of belief, he insists that the people have been manipulated and turned against the Government. He believes that the continuation of the protests may tear the country apart to the benefit of Romania’s enemies. Earlier this week, Dragnea accused President Iohannis of instigating the protesters against the Government. The PSD leader also claims that some multinationals may be involved in supporting the protests. Several organizations representing some of the biggest multinationals operating in Romania, such as AmCham, the Foreign Investors Council, and the Romanian-German Chamber of Commerce (AHK), criticized or expressed concerns about the Government’s ordinance amending the Criminal Code. How is this movement a victory of people power? 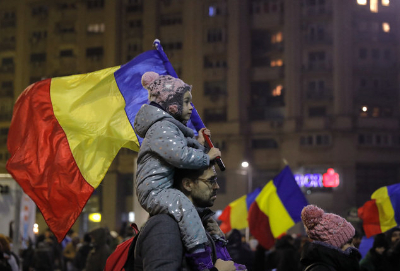 After six nights on the streets, Romanian people have won their first battle after the government scrapped corruption legislation that ignited the country’s largest demonstrations since the fall of communism. Romania’s streets have turned out to be the main guardians of democracy in the country, and the good news is when governments tighten the screw, it inspires a wave of civic creativity. This is the true victory of people power. One of the protesters put it rightly when he said, “In such a young democracy and with such a history, old habits of putting up with whatever is being thrown at you are hard to break. But 27 years of corruption are enough….They have awoken our sleeping giant called conscience and you can see them scared of it roaring in every city,” he says.And that they were able to break the habit, is their victory. Romania is considered one of Europe’s poorest and most corrupt countries. Last year, a report by the IPP thinktank revealed 15% of MPs elected in 2012 were either under investigation for graft, had already been convicted, or chose to step down for other positions. In many ways this past, intense week is just the start. The Romanian people are protesting in favour of well-functioning institutions and accountability, which they do not believe this government can provide.